Yesterday, after literally weighing my options, I decided to change the fork to a rigid aluminum one. On a whim, I also decided to change the All-terrain tyres to a pair of 1.5 Kenda touring slicks since KSH had a new shipment that just came in a couple of weeks ago. They’re really fresh off the line; shiny, black and soft. Ok, I admit I am guilty of being a weight weenie, in spite of my skinny label. 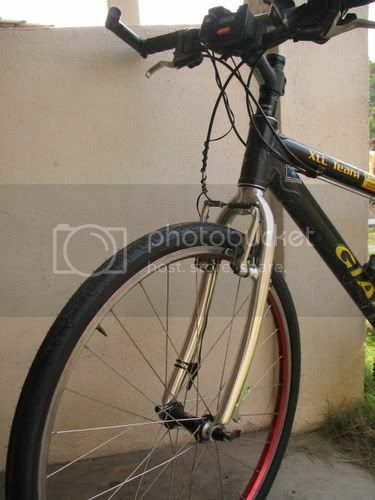 Oh yea … the bike now sports an ugly new kickstand as well – just so I don’t always have to find a wall for the bike to lean against; it is, after all fully-laden with 2 rear panniers and a front handlebar-bag. The shiny new fork complements very well the shiny new slicks. Nice.